Its summer down here in Australia, and this summer its hot, really hot. I keep getting status reports from my WD MyBook Live Duo that it is overheating. So I designed and printed this cooling stand to improve its passive airflow circulation - so far so good. 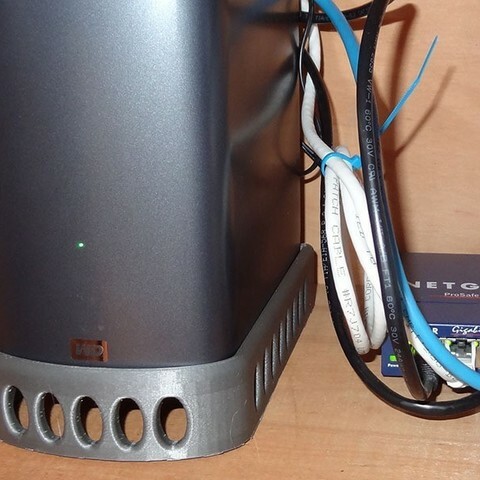 The stand will fit any WD Duo/Raid external storage device, like my MyBook Studio 4T. 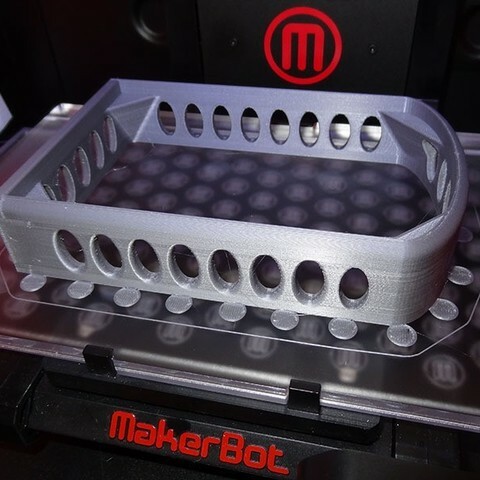 This cooling stand was designed using an ASIC solid in Shark FX (sfx file included) so will behave well with Makerware, ReplicatorG and skeinforge. UPDATE: Seems to be doing the job, I haven't heard a peep out of my MBL over the past few days and it been over 30 degrees c.
I printed this with silver PLA filament with 2 shells, 15% infill and 0.2 mm layer height with the skin module activated in Skeinforge/ReplicatorG so that the outside surface had a 0.1 mm finish. The plate includes my snap off ear raft print aids, to increase the surface area of the narrow edge to prevent them from breaking loose during printing.